Want a glimpse into the future? We found the most innovative phone accessories currently on Kickstarter. Some are already on the market, while others need some support to get through the final stretch of development. SELFLY is a 9 mm thick phone case, which is also an autonomous flying camera device. Snap it onto your phone, let it fly and control it through their app. SELFLY operates for 5 minutes in the air, which is enough to take about 15-20 selfie flight maneuvers. It’s available for iPhone 6, iPhone 6 Plus, iPhone 7, iPhone 7 Plus, Galaxy S6 Edge, Galaxy S6, Galaxy 7, Galaxy 7 Edge and Nexus 6. LenzO lets you take high-quality photos and videos up to 330 feet under water. Choose between settings like video, time-lapse, slo-mo and panoramic among several other features. This case has solved the issue with water resistant phones interfering with the touchscreen, by using two control systems. One of them adjusts a small arm on the inside of the case. The other will transmit your touch letting you control camera functions on the phone. It so far available for iPhone 7 and iPhone 7 Plus. This is one of the phone accessories every camper needs! 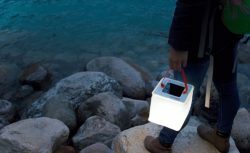 The PackLite Max Phone Charger is solar inflatable lantern and charger. It has a 5V USB output port with a fast charging output of 2.4 Amps, which has enough capacity to fully recharge your phone or other devices. You can either charge by micro USB for 1-2 hours or by a built-in solar panel, which takes 12-14 hours. The lantern packs flat and inflates into a lightweight and waterproof 150-lumen lantern. It even floats and can be submerged in water up to 3 feet. LuminAid runs for 50 hours on Low Mode. The inventors, two Columbia University graduates, pitched LuminAID on Shark Tank Season 6 and received an offer from all 5 Sharks and it’s so much more than camper gear. TheLuminAID lights have been used in more than 70 countries and after disasters, including Hurricane Sandy, Typhoon Haiyan and the earthquakes in Nepal. Do you like to travel but want to avoid expensive roaming fees? The Konnect i1 supposedly connects up to five devices to a global 4G LTE Hotspot with coverage in 100+ countries. It even allows free international calling in 20+ countries. So how does it work? The i1 will search for the strongest local carrier in their partner network and automatically connect you to a Wi-Fi. All you have to do is purchase a one-day plan for $10, which will give you unlimited data for your phone, laptop or tablet. Just connect to the NUU Konnekt i1 and start surfing. Mount your smartphone on the foldable stabilizer, power on and go. The Stedicam Volt helps to keep the subject in frame and at a stable horizon level. You can choose between sport, capturing fast moving moments, or movie mode, for the more cinematic shots. It accommodates phone sizes with or without a case from 100 to 250 gram in weight and 58 to 85mm in width and has 8 hours of battery life. Fun fact is that Sedicam isn’t just known for their phone accessories. The Steadicam brand has helped filmmakers for 40 years to capture smooth and shake-free videos. According to their website, it’s the “stabilization choice of Hollywood”.